There are hundreds of ways for bloggers and website owners can monetize their blogs and websites. Participation in affiliate marketing is, perhaps, one of the most payable ways to convert your readers into revenue without undermining reputation with ads and dishonest promotions. Directing your readers to a service in exchange for commission of the purchase sounds not like a bad idea, doesn't it? Cart2Cart offers you to become our affiliate partner and earn 20% commision from very shopping cart migration performed by a user who reached our service through your affiliate link. But first things first. Let's figure out what is Affiliate Marketing and who are Affiliate Partners. Affiliate Marketing is a marketing practice and a way for businesses to sell its products by signing up individuals or companies ("affiliates") who will market and promote the company's products to customers for a commission. This practice allows affiliates to earn money on product sales without creating the product by themselves. Affiliate Partners - are individuals (bloggers, website owners, opinion leaders) or companies that promote other businesses’ products at their own website. Visitors or customers of affiliates websites are redirected to the principal’s website to buy the product. Affiliates are earning the commission by recommending the product to others. 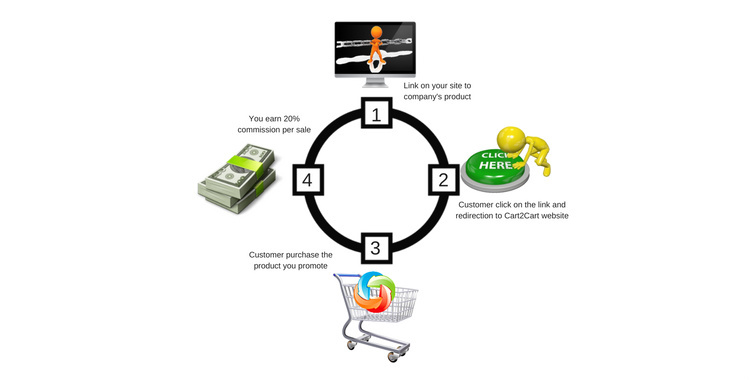 How does Cart2Cart Affiliate Program work? That’s all. Now, everything else is up to your readers and Cart2Cart service itself. Who can become Cart2Cart’s Affiliate partner? Bloggers, website owners, opinion leaders or simply active Internet users. The only thing: you have to deal with or, at least, be interested in eCommerce, because Cart2Cart - is the migration service of platforms for online stores (eCommerce platforms, shopping carts). Cart2Cart is the leading and most popular automated tool for migration between shopping carts in dynamically developing eCommerce industry. Every year thousands of new online stores appear, and 80% of merchants identify a wish to switch their platform for another during some e-store existence periods. Along with store owners, Cart2Cart is frequently used by eCommerce developer companies and freelancers. It is a combination of simplicity, automation, moderate price and exceptional quality. During 7 years being presented on the market Cart2Cart performed more than 30k successful migrations. Cart2Cart supports migration among eCommerce most famous platforms like Shopify, Magento, OpenCart, WooCommerce, PrestaShop, BigCommerce and many others. With its help you can easily switch between 75+ shopping carts. How much can Cart2Cart Affiliate Earn? To be honest, everything depends exceptionally on you - the better content you post, the more people sign up for our service and, as a result - the more money you get. You post the article about WooCommerce to Shopify migration and bring the agent to your site: representative of web design company, which is dealing with development for eCommerce or freelancer. They sign up and perform the $200 migration once a month. As a result - you get $40 on your account monthly. Cart2Cart is the world’s #1 shopping cart migration service. Cart2Cart is the fully automated service which doesn't require from its users any tech or developer’s skills. This tool supports the widest range of transferable entities, which could be swiftly moved to a new target store in few hours. Cart2Cart provides 24/7 support to its customers, and in case any questions will occur, the support is always there to solve them. What do you get if you are Cart2Cart affiliate partner ? 20% commision from each migration performed by a customer, redirected from your affiliate link. Consultations regarding service's specifics; assistance in content creation; help in content promotion. Control over traffic stats from your personal account, tracking of each visit from your affiliate link. 24/7 Customer support for fast answers to any issues. Start making passive income right now and sign up to become Cart2Cart affiliate partner. 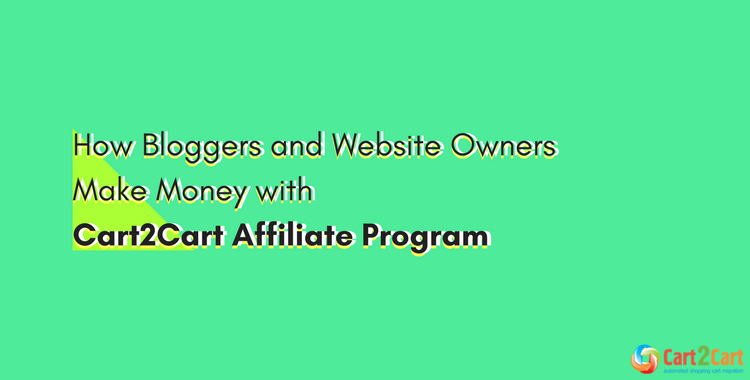 If you need some help or you are interested in any other questions related to Cart2Cart Affiliate Partner Program - feel free to contact us.